Our government said its goal was transparency. Told by the Trump Administration that they had to post all prices, hospitals disclosed how much we would pay for thousands of procedures. Vanderbilt University Medical Center’s list included a charge of $42,569 for an “HC PTC CLOS PAT DUCT ART.” Miami’s Baptist Health revealed that a “Visceral selective angio rad” was $5,538. You can see the problem. Without a common language, there was no way to compare…or even know what you were paying for. There was no way that the transparency initiative would stem the rise in healthcare costs. And that is where we are going. We are just going to compare the rise in healthcare costs to other everyday expenses and then see what they all have in common. While average prices have gone up 56% during the past twenty years, certain categories of goods and services are cheaper. Dropping the most, TV prices were down more than 80%. Somewhat similarly, typical toys and software also decreased considerably. Through trade, we can differentiate the more expensive from the more affordable goods and services in the graph. Starting with a definition, let’s just say that a tradable good or service is sold away from its home country. Correspondingly, our nontradables remain where they were made. In a recent paper, the U.S. Bureau of Labor Statistics (BLS) divided the CPI into tradable and nontradable goods and services to compare their price trajectories. Their conclusion? From January 2010 to December 2015, tradable goods had a 2.5% deflation rate while the nontradable inflation rate was 13.5%. And this takes us back to hospital prices. Where does this take us? Trade’s competition and arbitrage lead to lower prices for many items like TVs but not medical care. 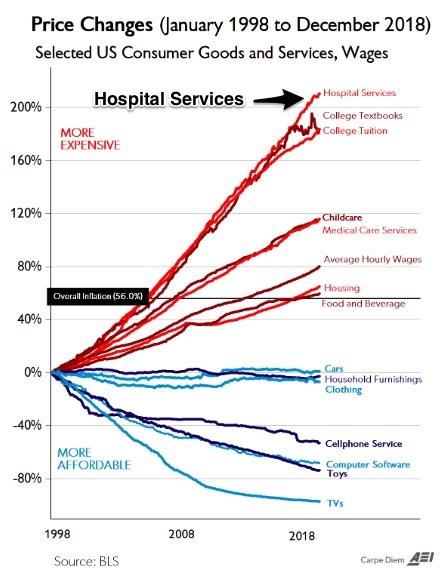 So yes, far beyond trade, there are many causes for skyrocketing healthcare costs. But, knowing they are primarily composed of untradable services, we can better grasp why they have a much higher inflation rate than tradable goods. My sources and more: Pairing this NY Times article with economist Mark Perry’s “chart of the century,” created an interesting synergy. Then, for tradables and nontradables, I returned to this BLS paper and all of the pieces came together. Please note that the authors of the BLS paper expressed concern that their time frame was just six years. They suggested further research in a number of areas. Several sentences in this post were in a past econlife. After publication, this post was slightly edited to improve clarity.